Having a website has become one of the most important ways to successfully present your company and to reach customers who are most likely to use the internet to find information about a certain product and ultimately buy it. Nonetheless, creating a website is the easier part, as your website must appear at the top of search results in order for users to be able to find you (not including the searches when a user types the name of your company, when you are most likely to appear first). When users look up a word or phrase using the search engines, they get a displayed list of search results. They go through this list and try to find the result they need, the result that is actually related to the word or phrase that has been used in the search query. However, based on the researches, more than half of users will only scan through the first couple of results, and they are most likely to click on the first one. This is the reason why being positioned at the top of the search result page is an important goal if you want to reach the users. The discipline that explores different strategies in order to help you get better positioning in the search engines, and thus promote your business online, is called search engine marketing. Search engine marketing, or to use a shorter phrase, search marketing, is defined as a series of actions that are aimed at increasing visibility of a website in the search engines through both paid and free processes. The main goal of these processes is to increase the visibility of a website and gain traffic, in order to increase sales and conversions. Search engine marketing should be an inseparable segment of the marketing department in a company, as it can significantly promote a company, as well as collect relevant data about the customers, which helps with market analysis. As such, search engine marketing requires a comprehensive strategy which will include the goals, as well as planned actions that should be conducted in the purpose of achieving those goals. The actions in the process of realization of the strategy will differ, depending on the type of search marketing that is used. Besides different strategies involved, various tools are used in the purpose of analyzing the performance of the website and the efficiency of the strategy that is being implemented. Tools are required with both free and paid search marketing, as they enable realization of different sets of actions that will help with realization of the goals. The goal of this e-book is to explain the importance of search marketing, as well as the main strategies and tools that will help with ranking higher in the search engines. Before we continue with the topic, it is essential that you understand some basic terms that are used in search engine marketing. SEM – Search engine marketing represents a part of the internet marketing which uses search engines result pages to promote a website, using both organic and paid reach. SEO – Search engine optimization is a process of improving visibility of a website in the search engine result pages through organic reach. PPC – Pay per click is the part of paid reach in the search engine marketing where you need to pay each time someone clicks on your ad. CPC – Cost per click is the amount of money you pay for one click on your ad, which is specified in the advertising campaign settings. CPM – Cost per mile represents cost per thousand impressions. It is one of the advertising payment plans, where you pay the price per thousands views. Search query or keyword query is the word or phrase that the users type into the search engines in order to find more information about that specific topic. SERP – Search engine result page is the list of results displayed by the search engines as the response to the search query. Conversion usually means converting a website visitor to customer, but occasionally, websites may use metrics other than sale as conversion, such as sign up for a newsletter, visiting a certain page, etc. Landing page, also called lead capture page, is a page which appears after the user has clicked on the link displayed in the search engine result page, regardless of that being organic listing or paid ad. SEO (Search engine optimization) and PPC (Pay per click) are the two types of search engine marketing. These two represent two different approaches which both have the same goal, how to increase the position, i.e. visibility of a website in the search engines. The main difference between SEO and PPC is the type of reach you want to achieve. Search engine optimization increases so called organic reach. This means that working on search engine optimization you try to increase the number of users who will find your website “naturally”, through the search engine. The main goal with search engine optimization is to use a set of strategies and tools, while following the best practices and recommendations, in the purpose of improving the position of the website in relation to specific keywords or keyword phrases. It is essential for these keywords to be related to your business, so the selection of keywords is one of the first tasks in the process of search engine optimization. In this case, your goal is to increase the position of your website in the search results, which is based on the keywords you suppose the users would search for. 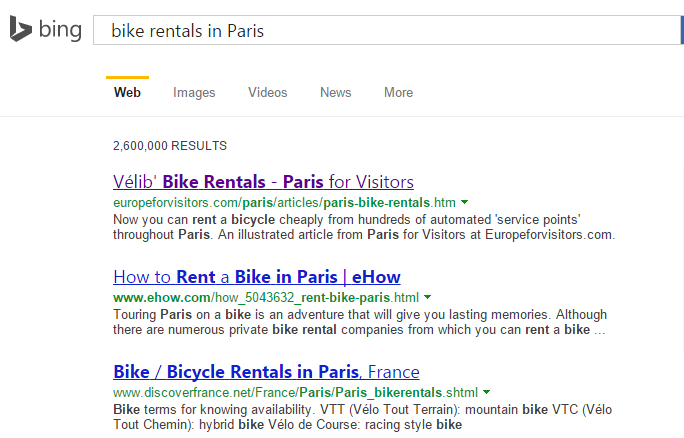 For example, if you specialize in renting bikes in Paris, you want to be ranked as higher as possible when someone uses a search engine to look for a bike to rent in Paris. 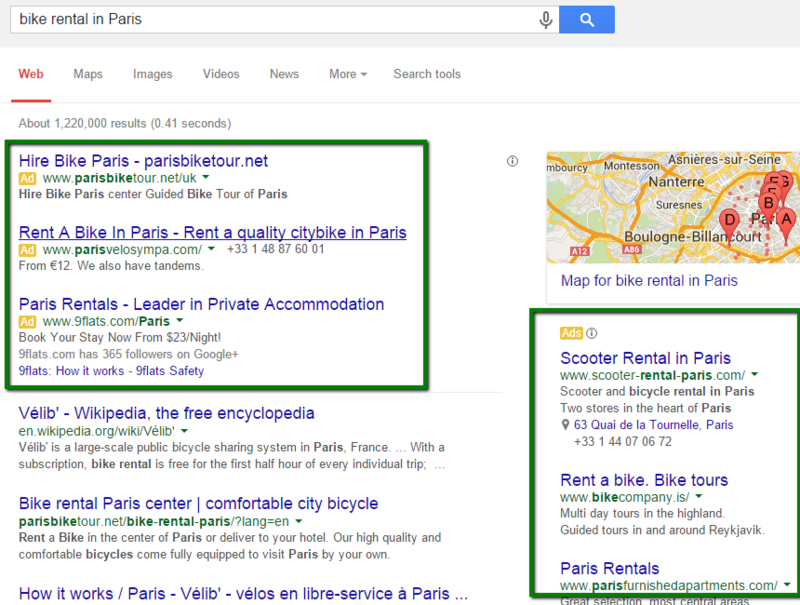 Have in mind that organic results are displayed below the paid results in the SERP. Search engine optimization is a comprehensive process that requires a lot of work which will pay off in the increased visibility of your website in the search engine result pages. This process is also considered to be long-term, since the benefits of the website optimization are long-lasting as opposed to paid reach. When it comes to SEO, it is important to differentiate between the so-called white hat and the black hat SEO. White hat SEO uses the best practices and recommendations for conducting an optimization of a website. It includes actions recommended by the search engines as things out of which your website can benefit, and that is why you should apply those practices. Black hat SEO includes the practices that are designed for the purpose of misguiding and manipulating search engines’ algorithms, in order to increase positioning. Black hat SEO uses the practices that are not recommended by the search engines, which is why they could have negative effect on your website, and they may even result in penalization by the search engines. Penalty represents a negative impact on a website’s ranking. Search engines strive to provide quality users experience and they try to find spam through algorithm updates and manual actions. Penalty can result in the drop of rankings, decrease in traffic, conversions, etc. Occasionally, the website might not even be displayed in the search result page. Even though search engine optimization is often referred to as free search engine marketing, it does require a lot of time from your part or even hiring an expert to help you with some of the tasks. Therefore, saying that SEO is free is not entirely true. SEO also requires a certain period of time to optimize a website and then to get indexed by search engines, which will prolong the time necessary for you to get ranked, while paid reach will help you with this task much faster. PPC, on the other hand, uses paid reach to help you reach online customers. Although paid search marketing is most often referred to as PPC (pay per click), it actually includes other types of paid marketing, such as CPC (cost per click) and CPM (cost per thousand impressions). Paid search engine marketing requires paying for ads that will be displayed in the search engines. In this case, there is no need to look for the ways to improve the position of your website organically, but instead, all you have to do is to set up a campaign through an advertising program. This way, your website will be displayed as the paid result every time a user searches for a certain keyword that is related to the keywords you have provided when creating a campaign. 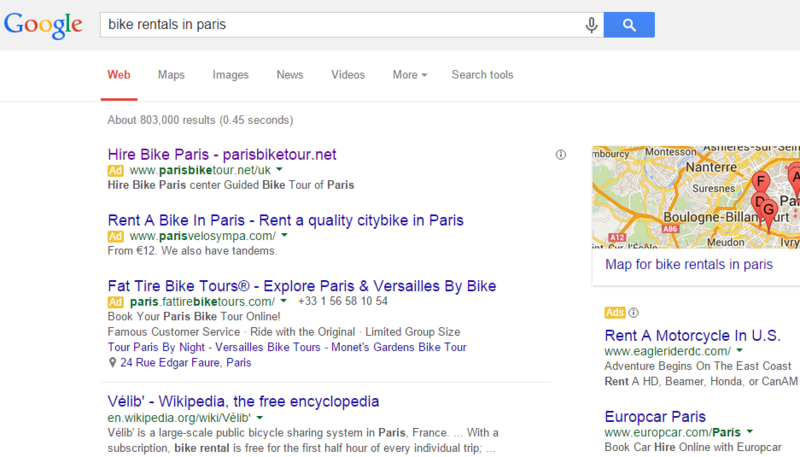 For example, if a user looks for bike rentals in Paris, the paid results will appear above all other results. Since these results are ranked at the top of the search results, this increases the chances for users to find your website. Paid results are displayed above the organic results, on the right side in the search result page, and they can also be displayed at the bottom of the search result page. You can also compare the reach between several search engines. 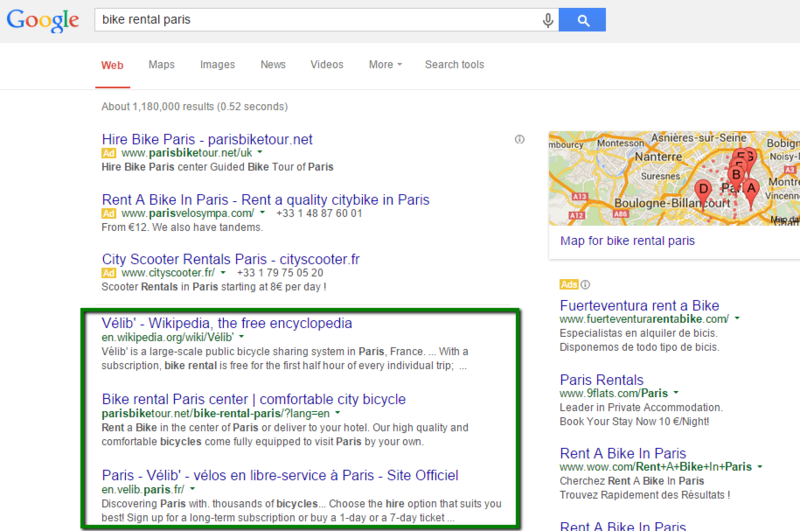 For example, we can use the same keyword phrase (“bike rentals in Paris”) in three search engines. As you can see, both Google and Yahoo! show paid search results at the top of the search result page, which are then followed by organic reach. On the other hand, Bing shows no paid results for this particular search query. Comparing the results in several search engines can help you find out how your website is ranked in different search engines, as well as which websites are shown as paid results for the keywords that are relevant to your website. You should have in mind that situation on the internet changes constantly. There are numerous websites being created every day, and people are starting to use search engine marketing to compete on the internet. At the same time, there are those who give up or turn to different projects instead. This is why it is essential to monitor the situation on the internet, to monitor your competitors and to stay up to date with recommendations and best practices that can help you increase the visibility of your website. Regardless the type of search engine marketing you decide to use, you need to monitor your work and the performance of your efforts in order to evaluate the efficiency of SEM. With paid search engine marketing you will be able to monitor the performance of the campaign through the advertising program used to create the campaign, while with SEO you will need to use external tools for monitoring the performance of the website and organic reach. No matter how situation develops in the future and regardless how search engine algorithms change, the fact remains that websites will be competing with one another for the top position in the search engine result pages. The tools and the best practices might be changing, as they have been over the years, but search engine marketing remains a part of marketing, a part of the activity that will certainly help you promote your business.